Standleuchten N.R. 1/2, two lamps. Final projects at the »Akademie für Gestaltung im Handwerk«, Munich, 1999. Material: paper and aluminium. The lamps have been developed particularly in context with my investigations regarding the perception of light and color, based on Josef Albers' »Interaction of Color« and my material experiments with paper. The studies at the »Akademie für Gestaltung« have been from seminal importance for my work and personal unfolding. See below particularly the remarks on the importance of the sculptoring of a so called »Oloid« as a basic study in problems of the transformations between static and dynamic structures. The two lamps did evolve as a final project from my early experiments at the »Akademie für Gestaltung im Handwerk« in material and form. Particularly the material experiments with paper and light had been an early base for the pieces. Below two studies with paper and light. The first one has been a paravent study based on experiments with paper »breakthroughs« regarding the effect on the translucency. The lamp study below the paravent has been made with the cut out negative forms of the paravent. Through a reduction of the lamp study sheets to only three elements, the base for the »Standleuchten« has been made. Below: Studies for the stand geometry. There has been made a round version with 3 papers and an angular with 4 papers (see picture below the stand study). The studies in the stand geometries exemplify beautifully, that one basic problem during the development of the lamps, particularly the version N.R. 1 has been the confrontation of static and dynamic structures, the transformations between the static stand geometry and the dynamic character of the paper sheets. See some insights regarding this important aspect below. Above: nicolas constantin, Schreinerarbeit (Intarsie, Nuß, Ahorn) 1995, 40,5 x 40,5 cm/ carpenter intarsia work. My carpenter apprenticeship (1995-1998) has been a seminal experience. The approach of unpretentious, precise and careful craft, appreciating the cunjunction between material quality, tools, working process and form is an exemplary demand for me, regarding the working process, work quality and personal attitude. Crucial point is the fundamental difference between immediate experience and painstaking, systematic work on the one hand, and the relation between long-term practice and investigation and the specific kind of (sensual) experience, understanding and deep gratification one gains from it, on the other hand. From the perspective of my work on »figures in movement«, the relation between craft and the crafted game as a space for human movement and interaction is from particular interest. These aspects are core problems particularly of the wall-triptychs investigation. One very specific study for the »lamps« and also a tremendously seminal inspiration for my work approach regarding my investigations in movement has been the sculptoring of a so called Oloid (see picture above) and the related reflections about transformation from static structures to dynamic ones. These discussions included a deeply insightful introduction and interest in the approach of Joseph Beuys. Some remarks on this. The »Oloid« has been developed 1929 by Paul Schatz. The »Oloid« form evolved through Schatz's investigations in the Invertible Cube. One core problem has been the question, how static forms can be transformed into dynamic ones. Sculpturing the Oloid has been an embodied experience to engage in these conceptual and formal problems. The experience given through the crafting of an Oloid is closely related to my later core motif of »figures in movement«. For my later work approach, the introduction and deep involvement in the work approach of Joseph Beuys, related to his interest in comparable questions regarding the transformations of static to dynamic structures in society, have been from greatest importance. For me, the lamps had been also formal, conceptual studies regarding these questions on a formal level, particularly exemplified through the differences between the static stand geometry and the dynamics of the material and the form of the paper sheets. Though the problem of the relations between static and dynamic forms is always somehow involved in my work, a more obvious and specific investigation in these aspects evolved through the work mercatus (2017, work in progress), an intervention, developed initially particularly for museum spaces. Below a casual picture of the second, rectangular version. One crucial aspect for me has been, that the paper has been manipulated in a special procedure, to give the sheets on the one hand the desired form but on the other hand leave the material accessible to subtle deformation according to changes in humidity and temperature. The development of the »Standleuchten« unfolded in the context of my investigations in the perception of light and the composition with light, conjoined with my interest for the quality of material and craftwork, based on my carpenter apprenticeship. From a personal point of view, the relationship between these »light sculptures« and my investigations in composition with light through my photographical images can be retraced most beautifully through a comparison of the lamps and meriggio. As another correlation in this sense might be from interest that the somehow iconic image plant, a study in light, movement and composition, has been done during my studies at the »Akademie für Gestaltung« in Munich, 1999, at the botanical garden. 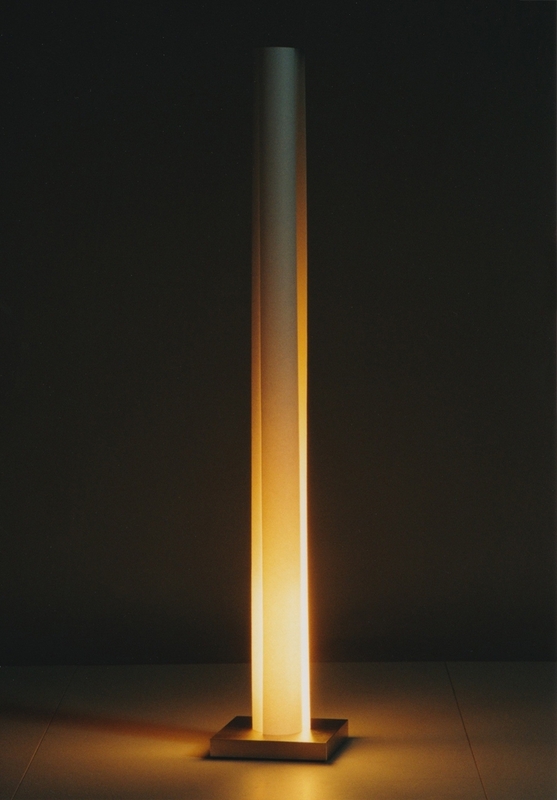 One early inspiration for the »Standleuchten« during my studies in Munich has been the visit of the Dan Flavin installation Untitled, For Ksenija for the opening of a wonderful exhibition space in Munich, the Kunstbau. Walking through the space, filled with light and particularly walking through the subtle transitions and passages of the changing light areas, has been an amazing, seminal experience regarding my fascination for light. Fitting beautifully to the fact that I did create two »Leuchten« as my final pieces, I discovered – on the occasion of being appointed to teach media studies in Munich 2018 and regarding the fact that our first field trip took place at the Lenbachhaus / Kunstbau – a catalogue of the 1994 opening, signed by the Designer Dieter Witte, one of the most distinguished »Lichtgestalter« in Germany.